- DSC is located on the back of the neck. - The club's name is mentioned on the lining of the neck and on the inside of the bottom of the shirt. It is weird to own a shirt for a city that doesn't exist but here we are... I am glad to have been able to buy this shirt as the shirts before this have been manufactured by Saller who don't fit tags to their shirts. The shirt is very Joma typical, which means that the material is very strong and the design is nice and simple. The team had a poor start in their first Bundesliga season. 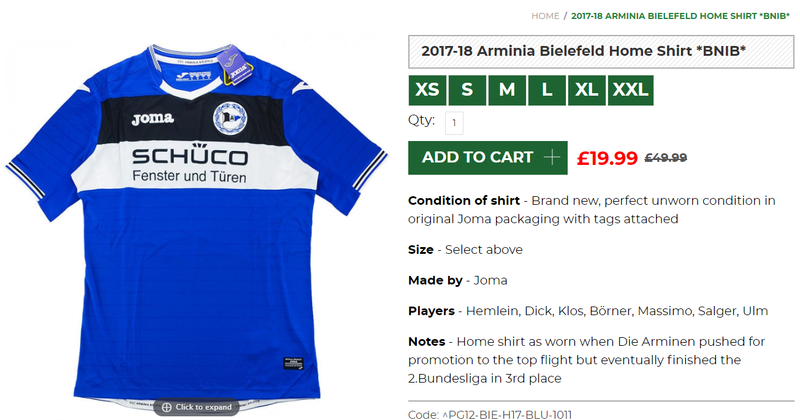 They bounced back to finish 14th, however, near the end of the season it was discovered that Arminia had engaged in match-fixing. Three of the ten games proven to have been manipulated directly involved Arminia. Two players for the club were banned for life (Waldemar Slomiany and Jürgen Neumann. Arminia was allowed to play the 1971–72 season in the Bundesliga, but were automatically relegated to the Regionalliga as a penalty. Arminia struggled in the following seasons, but were good enough to be appointed to the newly formed 2. Bundesliga in 1974.